After breaking box office records in 2014, Mozart’s timeless comedy The Magic Flute returns to Minnesota Opera in the revolutionary production by Komische Oper Berlin and the British theater group 1927. Whimsical hand-drawn animation (which took three years to create) synchronized with live performance sets a surreal stage upon which its quirky characters, all cleverly based on familiar silent-movie personalities, explore love, truth and the pursuit of enlightenment. Much of the 2014 cast returns for the encore production, including Minnesota Opera favorite Andrew Wilkowske in his role as Papageno, a comical, clumsy birdcatcher. Wilkowske was most recently seen at Minnesota Opera as Dr. Dulcamara in The Elixir of Love. His voice has been described as “nimble,” with an “impressively open top,” and he is one of the most versatile performers on the stage today. The Magic Flute is a production that’s back by popular demand. What does it feel like to be involved with a production like that when we hear so much about how opera around the world struggles to attract new audiences? Andrew Wilkowske: It is thrilling to be involved with this production of The Magic Flute. Twin Cities audiences are very discerning; they know theater and they know music. So to be back by popular demand here is a huge deal. This production has been a delight to audiences all over the world. I was on a recent tour of China with this production, and it resonated with audiences there just as much as at home. I think that speaks to the universality of the characters and the astonishing beauty and resilience of Mozart’s score. With much of the cast from the 2014 production returning, how much of the performance will audiences recognize compared to how much has changed? AW: There is so much going on visually and musically that I think you could see it a dozen times and find something new each time. In fact, during the last run of performances we did here, even the standing room section was sold out because of people coming back two or three times to see us! Christie Conover as Pamina and Andrew Wilkowske as Papageno in The Magic Flute. Tell me about the challenges in the role of Papageno. It’s often said to be an easy sing. Do you agree? AW: Papageno is my favorite character to play. It’s true that he doesn’t have the same sort of vocal challenges as the other characters — no long, exposed phrases or extreme vocal pyrotechnics — but inhabiting the role of Papageno presents its own challenges. First of all, the role is very physical (especially in this production). Also, he is the audience’s window into the story; he is how they can relate to the other characters. So it is a big acting challenge, but mostly it’s just plain fun! You’re widely known for your expertise in modern repertoire — do you bring any of that modernity to your role in The Magic Flute, a more traditional opera? AW: A composer friend of mine once told me that all music is modern music by virtue of the fact that we are performing it here and now, and I think he’s right. So in that sense, I guess I bring a little modernity to Papageno. I try to remind myself that The Magic Flute was once modern repertoire as well, and approach it with the same sense of wonder and discovery that I would with something newly composed. Along those same lines, this production has been updated a bit, hasn’t it? Minnesota Opera’s Artistic Director Dale Johnson has said that this “isn’t your grandparents’ Magic Flute.” What do you think he meant by that? AW: I believe Dale is referring to the state-of-the-art projections that make up this production. All of the actors play against hand-drawn animations that are projected alongside us, putting the audience right in the middle of the action. But all of the things we love about The Magic Flute are still here: the score (which is the real star of the show! ), the wit and charm of the characters, and the magic. 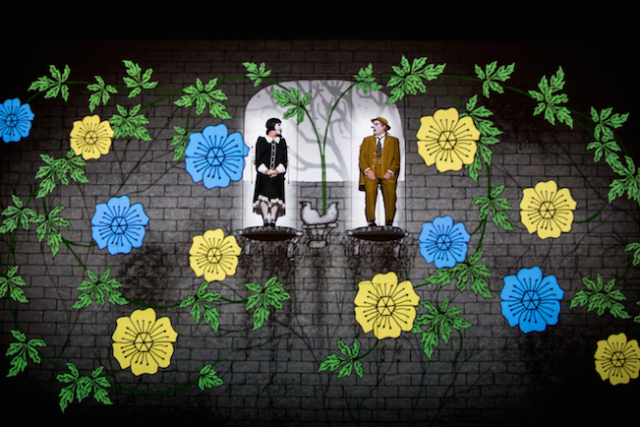 Because of the animation, this is the only production of The Magic Flute where truly anything can (and does!) happen. Our characters fight dragons, go underwater, jump tall buildings in a single bound — anything is possible! The Magic Flute runs at the Ordway Center for Performing Arts through November 22. For more information and to purchase tickets, head to www.mnopera.org.